There is no one size that fits all. When it comes to Excel, the default settings work fine in most of the cases. But if need be, you can easily customize many of the Excel Options. In this blog post, I will show you how to use Excel Options to customize your workbooks and get a better spreadsheet experience. In Excel 2010/13: Go to File –> Options. In Excel 2007: Go to Menus –> Tools –> Excel Options. Don’t be overwhelmed with all the categories and checkboxes in the Excel Options dialog box. You do not need to change everything, and in most cases, default setting works just fine. But here are some of the features that can give you more control on the way your Excel spreadsheets behave. In Excel Options, select General. In General options, within ‘When creating new workbooks’ section, change the default font type and font size. Now when you open a new workbook, it will use the new font setting by default. If you are sharing your excel workbooks with people who have 2003 version, you need to manually change the format to .xls. Instead of doing this manually every time, you can change the default file format Save setting. In Excel Options, select Save. In Save options, within ‘Save workbooks’ section, change the Save File format to Excel 97-2003 Workbook. You can also set the default to Excel Macro-Enabled Workbook if you work with macros. Now whenever you save a workbook, it will get saved in .xls format. With automatic calculation, a recalculation is triggered whenever there is a change in a cell/value that affects formulas (more so with volatile formulas). With worksheets that are loaded with a lot of data and formulas, this recalculation can waste a lot of time (and most of the time it is unnecessary) and make our workbooks slow. In Excel Options, select Formulas. In Formulas options, change calculation options to Manual. When manual mode is selected, you need to manually force a recalculation by pressing F9 key. By default, if you select a cell and press enter, the selection goes down. In a lot of cases, you may want to keep the same cell selected after hitting Enter. In Excel Options, select Advanced. In Editing Options, uncheck the option ‘After pressing Enter, move selection’. TIP: You can also achieve the same effect by pressing Control + Enter (instead of Enter). If your work involves a lot of numeric data entry with decimals, this one would be mighty useful. How it works – If you have to enter numeric values with 2 data points, instead of typing 123.45, you can simply type 12345, and Excel would automatically insert 2 decimal places. In Editing Options, select ‘Automatically insert a decimal point’ and specify the places. Caution: Remember, every time you enter a number, it will have 2 decimal places. So if you need 1 as the value, you will have to type 100 (considering there are 2 decimal places). When you insert a comment, by default there is a small red triangle that appears at the top left of the cell. While this is a good enough indicator, you are likely to miss comments if you have a lot of data/comments. One workaround could be to show all the comments at once. 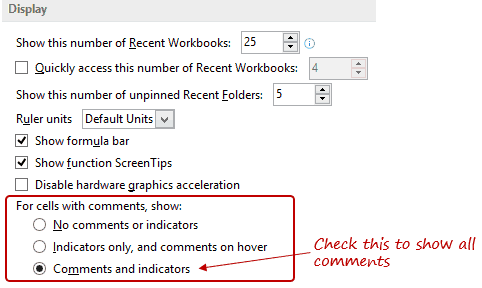 In the Display section, under the ‘For cells with comments, show:’ option, select Comments and Indicators. TIP: This would also be helpful if you are editing comments. Just click on the comment and edit it. You can hide all the 0 values in your spreadsheet with one single click (you heard it right!). Scroll down and go to the section – ‘Display Options for this worksheet’. 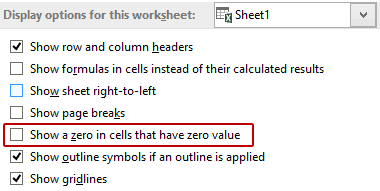 Uncheck ‘Show a zero in cells that have zero value’. Scroll Down and go to General section. In the field. ‘At startup, open all files in:’, enter the path of the folder that has the files that you want to open whenever you start Excel. Note: You can add more files to the folder and it would automatically open when you open Excel next. See Also: Excel Data Entry Tips. 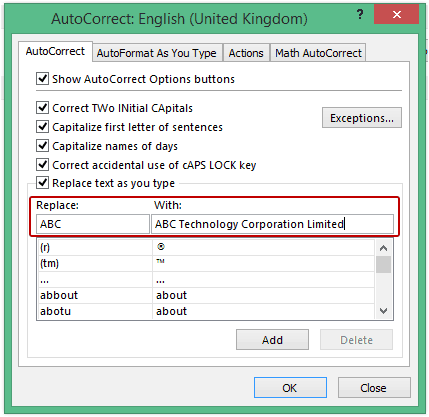 Now whenever you type ABC and hit enter (or space bar), it will automatically get replaced with ABC Technology Corporation Limited. Note: this change takes place for all office applications such as word and PowerPoint). 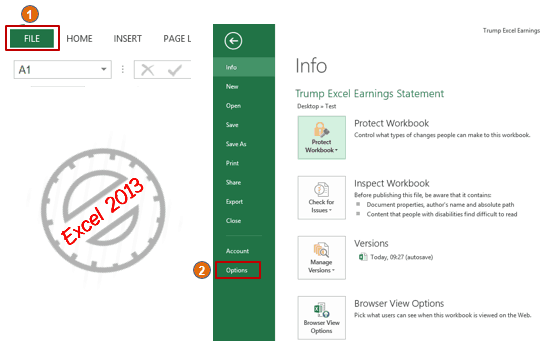 There are tons of other features that can also be customized using Excel Options. If you get some free time, do go through it and you may find some additional options that you can use. Give these options a try, let me know what you think. #5 and #9 are my favorites. How about you? A Collection FREE Excel Templates for Your Daily Use. 200+ Excel Keyboard Shortcuts &#8211; 10x Your Productivity. Note: As we have many regions in India, you can customize more by selecting the your desired region.Ex: Telugu(India) or Gujarati(India) . but its still not working. have attached the screen shot. awaiting your reply. thanks again. Hope you followed the steps i given. Please see the below screen shot for your information. Is there a way of having the equivalent of a General number format (which has no decimals or a floating decimal, as applicable) that includes commas without using Conditional Formatting? Hello Jim.. You can change the custom number format to get a thousand separator comma and fixed decimal places (to do this press Control + 1. In the Format cells dialogue box in Number tab, make the changes in Number category). I am not aware to get a floating decimal along with comma. I am building a spread sheet that is likely to have thousands of cells with conditional formatting to get them to display the way I want them. Do you know how much of an impact will this have on the performance? I suppose that if it is too slow, I can change the format with VBA each time an entry is made, just like I need to do with calculations to avoid having tens of thousands of formulas. 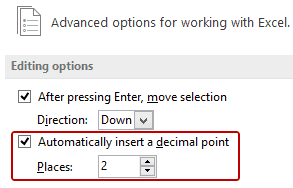 Frankly, I am surprised that Microsoft didn’t add a check box next to the Decimal Places Spin Button from your screen clip above for “Floating” many versions ago. Thanks for your EXCELlent website, tips, and tricks. I tried a similar custom number format, and the decimal is indeed annoying. Conditional formatting is volatile and would slow down your workbook. If you already have a lot of formulas/data, the impact on speed from conditional formatting could be more. 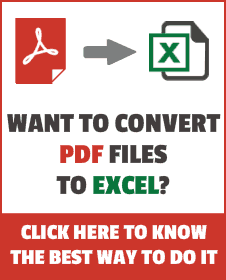 If you are working with a bunch of the same excel sheets everyday, then follow these steps. (Not applicable to Excel 2013). Have all the excel sheets you need open. Go to View –> Save workspace. Give the workspace a name and save it on the desktop. Now every morning/ as required, just double click on the workspace and all the excel sheets open automatically.